LONDON — LD Liz Berry is using a grandMA full-size console for the current tour of the Sisters of Mercy through Europe. The tour adds to the cult band’s nearly 30 years of live performances led by lead singer Andrew Eldritch and drummer Doktor Avalanche. Berry had previously lit The Sisters on a handful of festival dates. When the itinerary was revealed, along with the decision to use house rigs supplemented with a small specials package, she decided the time was right to try the grandMA control platform. 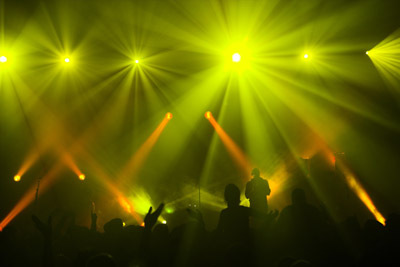 The lightshow is a moody, heavily back-positioned mix of color, beams and movement, with subtleties that require meticulous programming and execution. Berry said that once she’d grasped the basics, the grandMA proved to be straightforward. Berry added that she likes the flexibility of being able to set the desk out exactly as you want to suit the style of operation. The band gave Berry free rein, but Eldridge took a role in articulating ideas about lighting, and its absence. Together, he and Berry weave the light into the set as an element of the performances as he walks partially into or out of it, playing with the beams and haze. While the band had certain stipulations about the lighting, to further challenge herself, Berry also introduced her own visual rules — including using a maximum of two colors per look, plus black and white. The European touring package — supplied by west London based Panalux, consisted of six Clay Paky Alpha Beam 300s, four Martin Wash lights, two smoke machines and a hazer. Each song has a non-positional orientated preset on the spots programmed into a Cue Stack, with all the wash and beam activity busked and added over the top. Spot positions are also added live, in order to offer Eldritch opportunities to play as he prowls the stage, but should he choose not to be seen, a dark area upstage centre gives him a place to hide. For the European section of the tour, the grandMA was supplied by TDA, from Essen, Germany. A.C.T Lighting is the exclusive North American distributor for the grandMA. For more information, please visit www.actlighting.com and www.malighting.com.